NETWORK FINALS: CBS’s NCAA TOURNAMENT coverage adjusted down to 1.1/1.0/1.1. All else remained in place, although for the curious, DYNASTY’s 0.1 was 0.14 with hundredths included. CABLE HIGHLIGHTS: The NCAA TOURNAMENT owned 13 of the Top 14 slots on Friday cable, topped by TNT’s primetime UMBC vs. Virginia upset at 1.29, and declining to 0.18 for an afternoon game on Tru. The highest-rated non-basketball show was A&E’s LIVE PD, down a tick to 0.64. On HBO, REAL TIME WITH BILL MAHER was steady at 0.41, and HIGH MAINTENANCE was up 0.02 to 0.12. Discovery’s GOLD RUSH was at 0.41/0.40/0.39, compared to last week’s 0.76/0.46. MSNBC’s RACHEL MADDOW SHOW led cable news in the demo at 0.34/0.48/2.9M, above Fox News’s TUCKER CARLSON TONIGHT at 0.23/0.36/2.3M, and CNN’s ERIN BURNETT OUTFRONT at 0.20/0.24/900K. 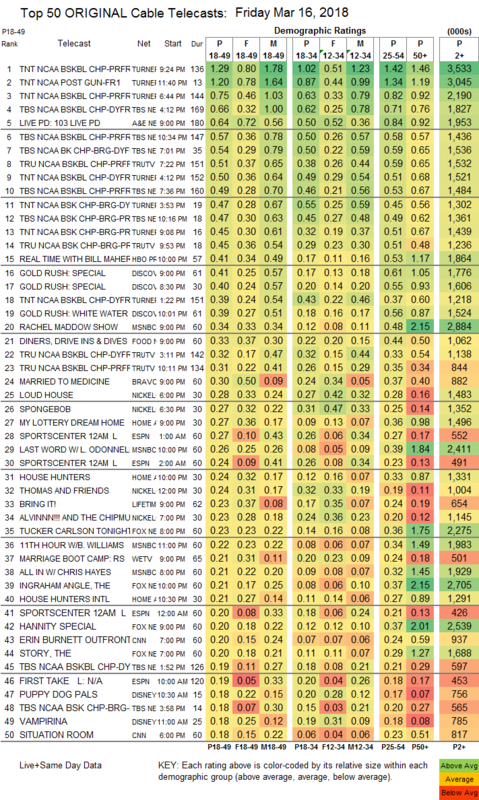 Food Network’s DINERS, DRIVE-INS & DIVES was at 0.33/0.28, compared to last week’s 0.29. Bravo’s MARRIED TO MEDICINE ticked down to 0.30, and RELATIVE SUCCESS ticked down to 0.11 HGTV’s MY LOTTERY DREAM HOUSE dropped 0.07 to 0.27, HOUSE HUNTERS lost 0.06 to 0.24, and HOUSE HUNTERS INTL was down 0.07 to 0.21. Nickelodeon’s early-evening pair of LOUD HOUSE and SPONGEBOB were respectively down 0.04 to 0.28 and down 0.01 to 0.27. 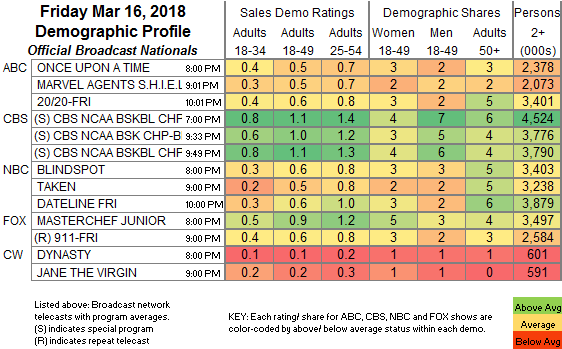 Lifetime’s BRING IT edged up 0.02 to 0.23. We’s MARRIAGE BOOT CAMP climbed 0.06 to 0.21. Cinemax’s STRIKE BACK was at 0.02/132K.